Isn’t that a funny title. Even I had to double take to make sure that it wasn’t typed wrong. But, yes, unautomate it is. And the man with the plan is Adam Baker. You likely know him from ManVsDebt. Maybe not, but if not, you should. And he’s got a plan to help you unautomate your finances. From reading his blog, it certainly seems to have worked for him and after reading the review copy of the ebook, it might just work for a few of you out there too. The concept is pretty simple. Automating your finances can go to far. It can cause you to “set it and forget it”. And that can lead to expenses getting out of control. Which is where Baker’s Unautomate Your Finances comes in. The eBook is 83 pages of wonderful advice for minimizing your financial footprint and living a life of controlled finances. He’s got a pretty impressive list of bonuses that you can get when you buy the eBook too! There’s two awesome interviews. A video one with Leo Babauta, who writes a ton on minimalist living. And there’s an audio interview with J.D. Roth of GetRichSlowly.com (And author of Your Money: The Missing Manual). He’s also throwing in the templates that he’s created for the program’s minimalist budgeting system. One in .pdf for printing and one in excel for use on a computer. And finally, he’s giving you all the updates you can handle. And he’s only charging you $17 for the whole shebang. I know he’s planning on upping the price to $27 eventually (I don’t know when) so I wouldn’t wait too awful long if your interested. This program could be a great thing for those of you who are feeling out of control of your finances and want a more simple way of getting them back under control. 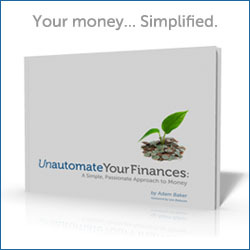 Disclaimer: I’m an affiliate of both Amazon and Unautomate Your Finances. If you click through and end up buying either the books I’ve linked or the eBook from Baker, I will get a portion of that sale. That didn’t sway my review, I really do believe all those things I said up there. Affiliate links like those are how I pay to keep this site operating, so I appreciate when you do click through. Thanks.